The recent controversy on Hitler’s book ‘Mein Kamph’ is much in Twitter, and social media should discuss it much before concluding if the impact of the book is good or bad. Hitler’s was born in Austria in Branau am Inn, Austria on the 20th April 1889. In his younger days, he wanted to be an artist against his family’s wishes. At the age of three his family moved to Germany. He was unable to pursue his studies as he did not have a liking to study. He never went to university and tried his luck in painting but School of Art; Vienna did not admit him. At last he entered politics. During the 1st world war, Hitler worked as a corporal in the Army. In 1921, Hitler became a leader in National Socialist German Workers’ party (NSDAP). In 1932, in presidential election Hitler came to 2nd position. President Hindenburg initiated Hitler as the Chancellor of Germany. Hitler was known for his strong views and following rules strictly. He was presented as a negative person all over and later proved to be a dictator. There are many stories and facts about Hitler, unknown to most of the people. Eva Braun was his sweetheart and always remained on his side. She started living with him and, prior to their said suicide together, Hitler married Eva secretly in a bunker. 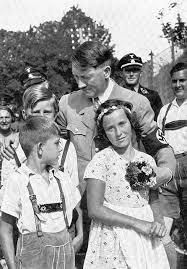 The Fuehrer was very fond of children. He liked to answer their questions and kept their company. Hitler was fond of wild life and insisted not to kill them for his food and never wanted hear about this. He liked search dogs and trained them personally.